I have ruined too many pieces of fish. Tuna steaks and swordfish seem determined to turn out dry and bland in my hands. When I mentioned my tuna steak troubles to my friend Wendy, her gentle response was something like "How could you possibly ruin Tuna Steaks!?!" I kept trying to be fancy, but all I needed was a store-bought Teriyaki marinade. Buy any Teriyaki marinade. 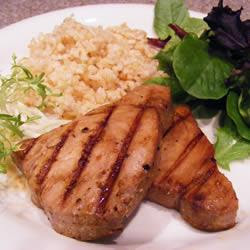 Add a little garlic and olive oil, and marinate the tuna steaks for at least 30 minutes in the refrigerator. They're good every time. I lightly seared for 1 1/2 minute on each side, and served with arugula salad and 'Bolivian' rice.